These words by the North Uist poet Mary Maclean (1921-2004) are addressed to her island’s mountain, where she describes the speed of its streams as moving fast from the summit then, ‘Gentle voiced to the quiet bevelled edge of the shore‘ . The phrase ‘You stand water-loud’ is highly apt to describe ‘Away with the Birds/Air falbh leis na h-eòin’ , a performance (29/30 August 2014) addressed to the surrounding sea, sky and land of Canna. Staged on the foreshore of Canna’s harbour, this location was noted by Martin Martin in 1695 as having ‘good anchorage‘. Ten women dressed in costumes based on shore birds, such as the oystercatcher and redshank, performed a score composed by Hanna Tuulikki. The composition was drawn from fragments of traditional Gaelic songs where different birdsong is mimicked. The foreshore defined as the area of land between low tide and high tide is a strange zone of land. Historically owned by the Crown, this land is always in a dance with the sea. The choreography of the piece, by Nic Green, deftly picked up on this. Over the duration of this one hour performance , the ten singers  moved over manmade and natural elements of terrain which included the old pier, new purpose-built jetties designed in the v-formation of a skein, and the seaweed coated rocks. The weather altered from overcast to a light rain, then sun. In the fourth movement entitled ‘flock and skein’, the tide had sufficiently drawn in over the wooden jetties for the crabs to run over the singers’ red neoprene feet. Further out in the bay, a curve of six horn speakers- each standing at four meters high- transmitted the calls of the women. During interludes, as the singers silently dispersed to re-congregate in another position, a series of field recordings by birdsong expert and wildlife sound recordist Geoff Sample, of birdsong from the Western Isles, was played. This clever shift in sound created a transitory space, suggestive of the women moving between human and avian form. Tuulikki carefully evolved ‘Away with the Birds’ over a period of four years, with the score beginning with one person, moving to three, nine, then finally ten singers for Canna. As Margaret Fay Shaw (1903-2004) noted in her book Folksong and Folklore of South Uist, ‘To sing a complete waulking song alone without anyone to take up the chorus imposes a considerable strain on any reciter’. The score is drawn from fragments of Gaelic lullabies, children’s songs, keening, dance and work songs from the Highlands and Islands (all women’s songs or sung from a woman’s perspective), from Barra to St Kilda, that include bird song within the narrative. Tuulikki, with Gaelic expert Mary Smith and Geoff Sample, analyzed the transcriptions of birds ranging from seabirds on cliffs, to redshank, oystercatcher, whooper swan, raven, Manx shearwater, geese and ravens. In the subsequent performance of ‘Away with the Birds’, through repetition and vocal techniques such as ululation, the score truly created ‘syllables that carry the air’ . The vocalists who joined Tuulikki, all brought with them their own reasons for creating sound that makes a connection with nature, ranging from a belief in ‘wildness’ , a connection to Canna, (Nerea Bello is the niece of the Canna House Archivist Magdalena Sagarzazu), to a background in Gaelic singing. In the seven week rehearsal period that led up to the Canna performance, the group went ‘deep into the material’  in a series of sessions around improvisation and play, in order for Tuulikki to organically develop the skeleton of the composition. Tuulikki sourced a number of the songs from the Canna House Archive and John Lorne Campbell’s recordings. Magdalena Sagarzazu, whose life’s work has been dedicated to working with Canna House, describes this house and its remarkable contents perfectly: “I often think of Canna House as an island within an island” . This archive was created by the island’s previous owners, the photographer and folklorist Margaret Fay Shaw (1903-2004) and Gaelic scholar, environmentalist, farmer and folklorist John Lorne Campbell (1906-1966) who gifted the island and archive to the National Trust for Scotland in the 1980s. Canna House, their collective archive and preserved home, contains their lifelong work of recording Gaelic songs from the islands and chronicling Gaelic culture through its language and traditions. Also, contained in the House’s archipelago are Shaw’s photographs, Campbell’s butterfly collections and possessions including an engaging cornucopia of ephemera relating to cats. Pattern cascades across wallpaper and curtain material, with bird curtains in the bedroom (now archival room) and fish swimming across the walls of the bathroom. The couple would have no doubt have greatly appreciated both the high spec technology embodied by the speaker horns and the sounds of women singing in ‘Away with the Birds’. A trawl through the Canna House archives shows that methods of recording and writing alter each time technology superseded itself, from recordings on wire, to reel to reel, to VHS. In Campbell’s own voracious correspondence and research, his notebooks and papers show that he utilized a typewriter, then carbon paper, followed by the earliest photocopies to the first computer printouts on voluminous concertinas of green lined paper with perforated edges. Tracing the lines that Campbell’s correspondence took from the island as he compiled a Gaelic dictionary is like following the flight path of birds. The correspondence shuttled back and forth between Canna House and destinations from all over Scotland and the world, in the days before the internet. There were letters from Sister Veronica in Nova Scotia; Father Allan Macdonald on Eriskay; Annie Johnston from Barra (Tuulikki drew from Campbell’s recordings of Annie Johnston and her husband Calum); and correspondences with academics from the universities of Edinburgh, Glasgow and Aberdeen amongst others. They worked with Campbell to try and pin down Gaelic for phrases like ‘a crop of pimples’ or to describe specific types of seaweed or on phrases relating to ‘Strange Things’. 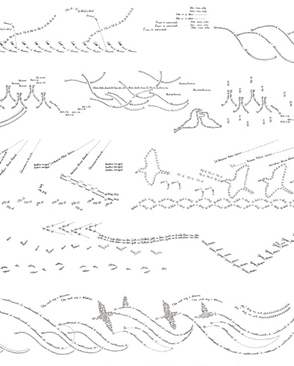 These lines of words in flight are very much present in the beautiful notations of Tuulikki’s scores for the performance, where the lyrics can form the chord  of a wing or denote the lift and fall of a bird in flight. The costumes are a key element of production linking ancient belief in nature to the spiritual. The colour red in Celtic culture is associated with the otherworld. The redshank is the bird who sings to the soul on its departure to the next. Nelson references red in the singers’ legs and the pleated insert on the back of the tunics. The designer cleverly combines contemporary with historical fabric in the singers’ costumes. 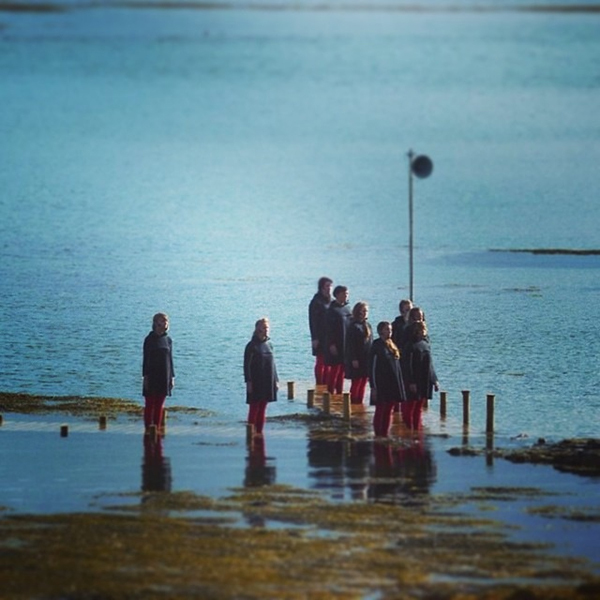 Local Canna wool made by islander Julie McCabe is used in the tunics, whilst hi-tech red neoprene creates the legs of the garment which allows the singers to move in the water. The hoods of the woolen shrugs, somewhat monastic in nature, are based on 1930s’ patterns of fishermen hoods, providing a protection against the elements. The hood is a key part of the outfit. When drawn up over the singer’s head it aids the visual transition of human turning into bird. The detail of the reveal is key too, with knitted white inserts in the sleeves under the arms, detailed with a ‘v’ pattern, mimicking a skein of birds in flight. Tuulikki mentions in a studio visit that she enjoys the wordplay of ‘skein’, meaning a skein of wool or birds. At the back of the charcoal grey tunics, an inserted red pleat accentuates choreographed movement. The transformation of the human form into the unknown is reminiscent of Margaret Fay Shaw’s photograph of islanders dressing up in sheep skins for Halloween. One of Tuulikki’s source material songs ‘An Eala air Loch Chaluim Chille’ -‘ The swan on St Columba’s loch’- suggests the bird’s association with this Saint. The sonic properties of Sounds are recorded in the ‘Life of St Columba’, by Abbot Adomnán, where visitors frequently stand on the far shore of Mull, to call over the Sound to Iona, asking to be picked up by boat. Indeed, Canna’s original chapel was dedicated to Colm Cille, with Campbell stating in his book ‘Canna: The Story of a Hebridean Island’ that the Saint ‘certainly must have visited [Canna] on his missionary travels during his exile in Scotland, AD 563-97‘ . ‘Away with the Birds’ fills the Sound of Canna with a new sound. Sailors coming in to moor in the bay during the rehearsals later remark on hearing mysterious, magical song. A collective feeling is created by ‘Away with the Birds’ through the experience of meeting fellow spectators travelling to and from the island, from time camping together, a camp fire and chance encounters in the social spaces of the island at the community shop and café . By the time the audience gathers on the shore road to watch the performance, they form a migratory ‘skein’ from the mainland and Skye. Following the first performance of ‘Away with the Birds’, an illustrator, Kieran Austin, goes camping to Garrisdale Point, over on the west of the island. When he returns several days later to Canna Harbour, he finds it uncanny that two hundred visitors have flown and that the island has returned to normal. This humanity is also very much present too in the Canna House Archive where, as well as the scholarly interplay on Gaelic phrases, throughout this correspondence a warmth flows between the writers. Academic secretaries thank Campbell for Christmas gifts; anecdotes describing local situations are swapped; greetings are passed onto spouses and people promise to come to Canna again soon. Indeed, the table in Campbell’s office is a billiard table, which he used a respectable office ‘table’ during the week thanks to a sheet of wood placed over it, and as the site of an on-going billiards competition with islanders at weekends. At its conclusion, with any human physical presence removed from the scene, the sound more than ever filled the land and seascape. Whilst the people and their voice are the source of oral tradition, with Tuulikki taking her place with this rich interpretation, it is the land and the sea that will endure. P.56, The Voice of the Bard: Living Poets and Ancient Tradition in the Highlands and Islands of Scotland, Timothy Neat with John MacInnes, Canongate, (1999). P.167, A Description of the Western Islands of Scotland Circa 1695, Martin Martin. Birlinn Ltd (1999). Vocalists: Hanna Tuulikki, Lucy Duncombe, Nerea Bello, Anna Sheard, Judith Williams, Nicola Scrutton, Mischa MacPherson, Kim Carnie, Megan Henderson, Kirsty Law. P.73, ‘Folksong and Folklore of South Uist’, Margaret Fay Shaw, second edition Birlinn Ltd (1999). First published Oxford University Press (1977). ‘My practice is wildness and not knowing’, Judith Williams. Vocalists biographies, ‘Away with the birds’ brochure (2014). From conversation in Tuulikki’s studio, 12.9.14. In conversation with Magda Sagarzazu. Any of the Gaelic words that Campbell could not categorise or that related to myths, second sight and ghosts, he entered into his ‘Book of Strange Things‘. In terms of birds and aeronautics, the ‘chord’ describes the imaginary line drawn between the leading edge and trailing edge of a bird’s wing. P.73, Folksong and Folklore of South Uist, Margaret Fay Shaw, second edition Birlinn Ltd (1999). First published Oxford University Press 1977. P122, The Peat Fire Flame, Folk Tales and Traditions of the Highlands and Islands, Alasdair Alpin MacGregor, The Moray Press, (1937). P.1,Canna: The Story of a Hebridean Island, John Lorne Campbell, Fourth Edition, edited by Hugh Cheape, Birlinn Ltd, (2004). Geoff Sample, from his notes taken on Canna, Aug 2014. From verse (v), 5. Night-flight to the burrow. Away with the Birds score, Hanna Tuulikki. ‘Away with the birds’ is part of the Culture 2014 programme. This entry was posted in Writing and tagged Away with the Birds, Canna, Canna House, Canna wool, Deirdre Nelson, Geoff Sample, Hanna Tuulikki, John Lorne Campbell, Margaret Fay Shaw. Bookmark the permalink.